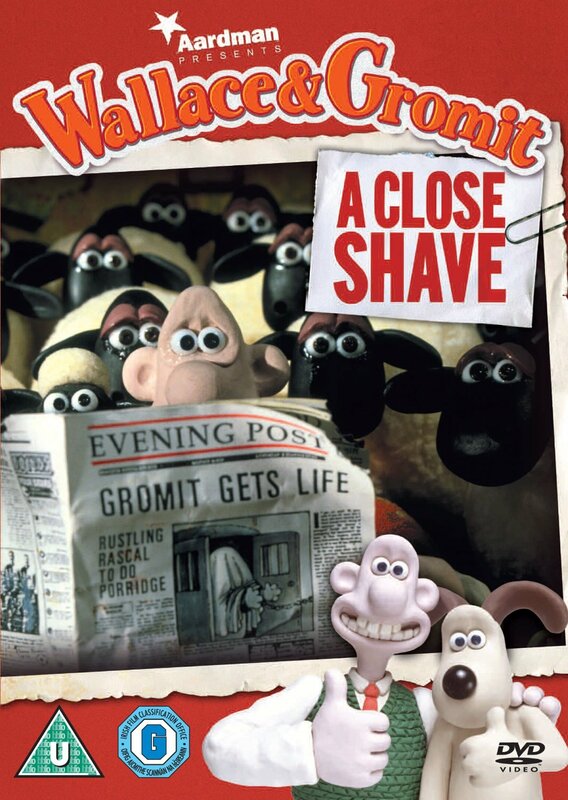 A Close Shave is a 1995 stop-motion animated short film directed by Nick Park at Aardman Animations in Bristol, featuring his characters Wallace and Gromit. It was his third half hour short featuring the eccentric inventor Wallace, and his quiet but intelligent dog Gromit, following 1989's A Grand Day Out, and 1993's The Wrong Trousers. To celebrate the film's premiere on Christmas Eve 1995, BBC Two's Christmas presentation that year (broadcast from 17 to 22 December) featured Wallace and Gromit. The main ident featured the two (Wallace wears a red crown and Gromit wears a green crown) eating Christmas dinner, with a large blue 2 (the channel's logo) situated in the middle of the table, covered with flashing Christmas lights. Several Christmas themed stings also involving Wallace, Gromit, and the 2 were shown between programs. The animation of these idents appeared slightly different from other Wallace and Gromit shorts. Following in the footsteps of its predecessor The Wrong Trousers, A Close Shave won the Academy Award for Best Animated Short Film in March 1996. Wallace's whirlwind romance with the owner of the local wool shop puts his head in a spin; Gromit is framed for sheep rustling in a fiendish criminal plot.